From left, RB executive Buster Arnwine congratulates students Sydney Brooks, Lindsey Wagaman and Dylan Seelye for their winning RB Challenge presentation. 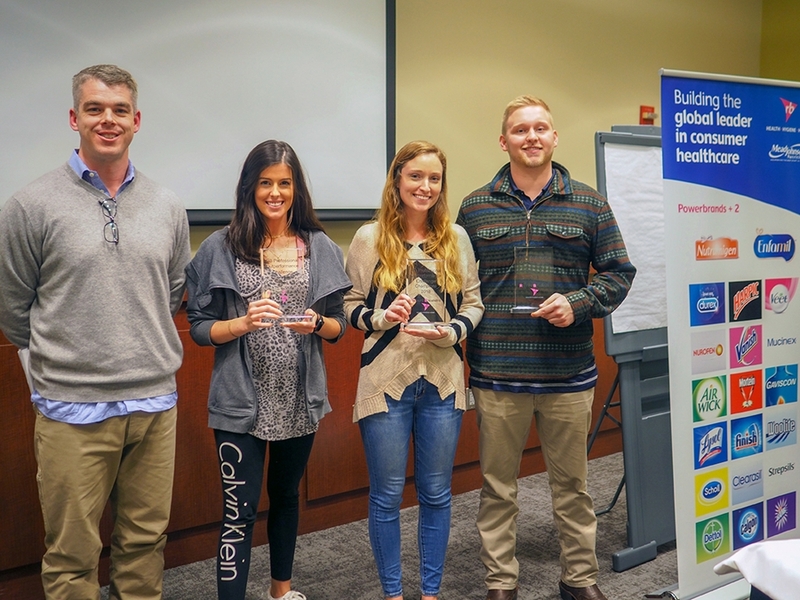 RB, a multinational consumer goods company, challenged students at the Sam M. Walton College of Business to think about the corporation's product in totally new ways. While the challenge competition lasted only two days, the winning team continues to reap the benefits. Last fall, Lindsey Wagaman, a junior at the University of Arkansas double-majoring in marketing and supply chain management, teamed up with fellow students — Sydney Brooks, a senior majoring in marketing, and Dylan Seelye, a senior majoring in finance — to accept the two-day RB business challenge: present a solution on how to increase market share of MegaRed Krill Oil, an omega-3 supplement. On the first day, student teams reviewed sales and research on MegaRed, a Schiff Vitamin brand that is a subsidiary of RB, a multinational consumer goods company. RB executives coached teams and delivered feedback on presentation strategy and approach. Wagaman, Brooks and Seelye gathered information, collaborated on ideas and developed a presentation. "My team agreed that the majority of people who took krill oil pills were affluent middle-aged to elderly adults. We decided to position MegaRed products as a preventative measure for the whole family in order to expand the target market," Wagaman said. "To do this, we proposed krill oil gummy vitamins for kids, biscuits and oil for dogs and subscription boxes. We highlighted different marketing aspects such as a heart mascot on the gummies and connections to popular nonprofit organizations like the American Heart Association." On the second day, student teams presented solutions to RB. While Wagaman, Brooks and Seelye's team won the challenge, they received more than just bragging rights. "Hands-on experience is one of the most valuable skills students can have. Having the opportunity to work on a real problem faced by a company helps students change their perspective and think about issues differently," Wagaman said. "Many of the questions recruiters ask in interviews are about past experience in particular situations. Being able to draw on these experiences as answers to interview questions is a simple way to highlight hands-on experience and give students an upper hand when job hunting." "Jordan Fry was the RB representative I gave my executive pitch to. As I was going through my involvement and experience he continually asked me why I do the things I do, and what I'm passionate about. I had never taken a step back to think about what I was really passionate about from a professional standpoint before. This question was asked throughout the two-day competition. Because of the push to connect the personal aspect to our professional careers, my group and I incorporated personal stories and experiences into our presentation." "My group and I have remained in contact with RB representatives since the challenge," Wagaman said. "We have been able to meet with them to further develop our solutions from the challenge and receive executive mentorship. I'm looking forward to maintaining my relationship with RB and continuing to work with them on our ideas." "The most impactful part about RB's Challenge to me was the amount of direct feedback each student received. On the first day of the challenge we each gave our executive pitches to an RB representative. Students received one-on-one feedback including tips for interviews and professional advice. Direct feedback is not something most employers or representatives give to students seeking internships or careers," Wagaman said. "I would recommend all students apply for the spring RB Challenge because it's a valuable opportunity that not many students get." Students have the opportunity to take the RB Challenge on Thursday, Feb. 7, by registering on Handshake no later than Thursday, Jan. 31. Find out more about the RB Challenge through the Career Development Services at theSam M. Walton College of Business by emailing Catherine Beasley, corporate programs manager, at cbeasley@walton.uark.edu. The Office of Sustainability is coordinating a week-long series of events to celebrate Earth Week. Capstone projects conducted by U of A students enrolled in the sustainability minor will be showcased from noon to 1 p.m. Monday, April 22, in the Paul Young Jr. Gallery of Vol Walker Hall. The center's staff identified key faculty influencers who encourage students to take advantage of professional development opportunities to connect with employers or to learn career information. McKenzie Meehan, a junior majoring in supply chain management in Walton College, is one of five students nationally awarded an Excellence in Education Scholarship. Headliners Concert Committee presents the 2019 Springtime of Youth Music Festival Saturday, April 27, at the Washington County Fairgrounds, 2537 N. McConnell Ave. in Fayetteville.